One of the best-kept secrets of the automotive world is the Lane Motor Museum, a collection of about 400 (mostly European) classic cars that will celebrate its 10th anniversary this weekend. A 132,000-square-foot former Sunbeam Bakery, it’s now a spruced-up display space for the eclectic and impressive collection that has been put together by Jeff Lane, a mechanical engineer who grew up outside Detroit and inherited his dad’s love of British sports cars. A glance across the wide-open space that features a rotating stock of about 150 cars gives you the initial impression that this car guy simply collected one of everything he liked. But after looking at just a few of the cars on display and the informative plaques that accompany each—make, model, year of manufacture, and little vignettes of how and where they were found or donated—you quickly realize that this is a very well-curated collection. And every car has a story. 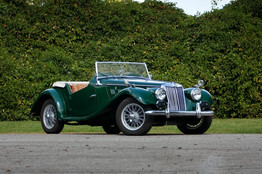 Perhaps the car with the best story is the beautifully restored 1955 MG TF 1500, in British racing green. It is the first car that Mr. Lane restored, and there’s a picture of him when he began the project at just 12 years old. There’s also a faded picture of him four years later, in 1976, taking his state driving test in the classic British roadster. While this is one of the best European car collections in the U.S., clearly Mr. Lane has his favorites. Among them: nearly 20 vehicles from Tatra that tell the evolutionary story of the Czech carmaker and its revolutionary designer, Hans Ledwinka. As one panel here explains, Ledwinka was one of the first designers to realize that the automobile would one day become common in nearly every household. As the chief engineer at Tatra beginning in 1921, he revolutionized engine design, suspension systems and aerodynamics. When the Communists took over from the Nazis, things changed at Tatra again. Shown here is the 1958 T-603 Saloon, one of the large sedans developed and built exclusively for party high officials and export to other Communist countries, such as Cuba. Ordinary Czechs couldn’t purchase it. Another designer Mr. Lane clearly admires is Marcel Leyat. The museum has dedicated a small alcove to a special exhibit on the French designer and the centenary of the first propeller-driven car he built. The museum also has a re-creation of Leyat’s 1919 Helico, his most successful propeller-driven car, as well as a replica of the unique pilot-training trailer that he developed. A propeller-driven car? One problem for early aviation, the exhibit explains, was that no plane could carry more than a single person. So how could you teach someone to fly? According to Mr. Lane, most would-be pilots were given instructions on the ground, then forced to solo their first time up. Leyat developed a special flatbed trailer that could be towed behind a car. A flight trainer sat on the trailer and, thanks to the wind generated by the speeding car, student pilots could move controls and feel how an aircraft would react in flight. As much as some of these early car designers wanted everyone to own a car, not everyone could afford one. This was especially true in economically devastated Europe after World War II. This led to the development of affordable, efficient micro cars, which are highly sought after by Mr. Lane and other fans. One of the most eye-catching is the 1965 Peel P-50, the smallest one-person micro car ever made. The P-50 is just 4-feet-5-inches long, 3-feet-3-inches wide; has a 49cc fan-cooled engine with a top speed of 35 mph; weighs 250 pounds and originally cost just £200 ($318 today). It has no reverse gear, but a “reverse handle” that let anybody pick up the back end and swing it out of a parking space. Mr. Lane has developed a network of automobile enthusiasts who both donate cars to the museum, a 501(c)(3) nonprofit, and volunteer to restore cars. Among the other unique vehicles he has on display are a 1964 German-made Amphicar, the most successful amphibious car ever produced; a 1922 Buick Speedster that participated in the modern-day re-creation of the Great Race; and a 1932 Lancia Dilambda, one of the earliest Italian luxury cars. What’s perhaps most impressive about this collection is that Mr. Lane says that 95% of the cars are in working order and the staff goal is to drive each one at least twice a year. Maybe so, but they’re great to look at just sitting idle. Mr. Yost is a writer in Houston.